Dorjee Wangchu of Namtsering Village under Lungla won the The title of Mon Ser-Gyelling 2018 with prize money of Rupees Eight lakhs. The grand finale of Mega singing hunt Mon ser-gyelling( The golden voice of monyul in Modern Song) and Mon Rig-zhung Ser-gyelling( The golden voice of Monyul in Folk song) 2018 season -03 under the banner Film Federation of Monyul was conducted on 29th Oct 2018, thousands of audience gathered at Men-tsem-tse ground to witness the event, this event was started on 16th of September 2018 and was inaugurated by Chief Minister Pema Khandu who is also the chief Patron of Film federation of Monyul. This event was initiated way back in 2010 by Pema Khandu when he was not in politics, his concern for preservation of folk songs and to attract the youths towards rich traditional songs made him initiate this mega singing hunt, and till so far this platform has produced many local talents in the field of singing, one among those is Thupten Tsering who recently gave programmes in European countries, this event is being conducted after every three years first was in 2010 and the second in 2013. A Book on Monpa folk songs written both in Bhoti and English by Thutan Tashi Shastri and sponsored by MLA Tawang Tsering Tashi was also released by the chief minister on this day, in presence of MLA Lungla Jambey Tashi, HMLA Tawang Tsering Tashi, DC Tawang, Sang Phuntsok, President Monpa Mimang tsokpa Rinchin Dorjee and other galaxy of intellectuals of the society. The title of Mon Ser-Gyelling 2018 with prize money of Rupees Eight lakhs was won by Dorjee Wangchu of Namtsering Village under Lungla, whereas the title of Mon Rig-Zhung Ser-Gyelling with prize money of Rupees Five lakhs was won by Pema Tashi of Thikshi Village under Zemithang circle. 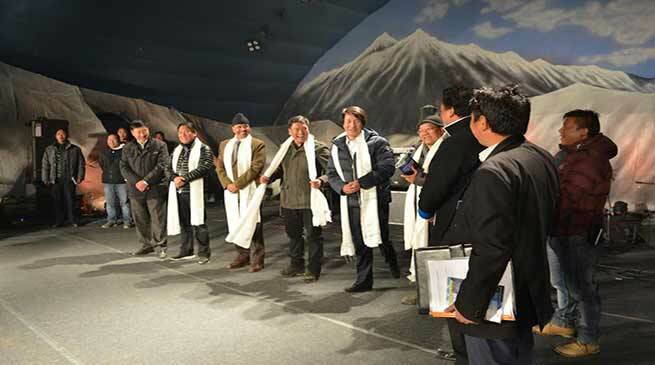 The other prize were 1st runners up in Mon Ser-Gyelling carried a prize money of Rupees Four lakhs won by Lobsang Delek from Jang,and the second runners with prize money of Rupees two lakh was won by Sangey Norbu from lish village under Dirang. The first runners up for mon Rig-Zhung ser-gyelling carried a prize money of rupees Three lakhs won by Jambey Thutan from seru village whereas the third place was bagged by Genden Namgey from Shakti village of Lungla area. The prize money of this talent show since beginning is being sponsored by Pema Khandu and his family . As a Monpa I really appreciate our most beloved Shri Pema Khandu, Hon’ble Chief Minister of Arunachal Pradesh was so kin to promote and bring back on track that dying our true flok songs and classical Monpa Rigzshung songs. What a wonderful thoughts and vision to start with a beautiful named in banner the Mon Rigzshung Sergyeling and Mon Sergyeling many young people got an opportunity to know their own talent and proof themself how talented they are. We always talk about the preservation of our culture,traditions and language. Now it is truly and practically happining for preservation of our culture, traditions and language forever. Great job and thank you Pema Khandu sir, May Lord Buddha bless you for your longivity and fulfill your wishes.